Joseph Alfred Stevens was married to Rebecca Annie Stevens, of 57, Lion Street, Walworth, London. 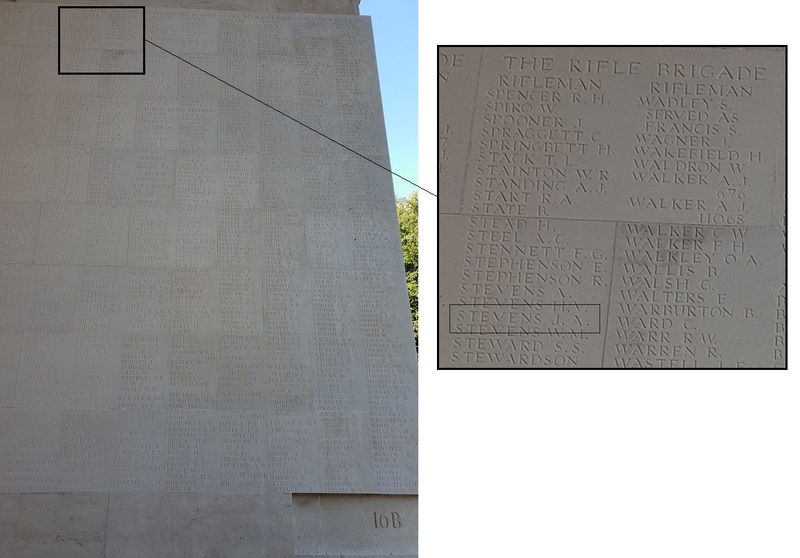 He has no known grave and is commemorated on panel 16B of the Thiepval Memorial. On the day he was killed 13th Battalion had to attack German positions at Contalmaison, France. They would lead the attack of 111st Brigade. On their left the 25th Division would attack and on their right the 23rd Division. The attack would be supported by a heavy artillery barrage. The author of the book Somme 1916 (Lyn MacDonald) wrote what happened during the attack on pages 134-143. She wrote (translated from a Dutch copy of the book) about Rifleman George Murrell of B Company who noticed there was no artillery when they attacked. His brother, who served in the same battalion, was hit and told George to continue the attack. Shortly after Murrell was hit in the leg. He wasn't the only one who noticed there was no artillerysupport. When Lieutenant-Colonel Charles Frederick Pretor-Pinney looked to behind his own unit, he saw nobody of the Royal Fusiliers, who were suppossed to follow the 13th Battalion. He also saw no troops on his left and right flanks. Although they were on their own the battalion managed to capture the first German trench and some even made it to the third line. Just when they made it to this third defenceline a messenger reached Lieutenant Colonel Pretor-Pinnet with the message the attack was cancelled. The message had reached all the other units on time, but not 13th Battalion Rifle Brigade. The Battalion had to retreat to their starting position. Other Commonwealth units who saw the movement at the German trenches thought the Germans were preparing an attack and they called for the artillery to bombard the area. Just when the survivors of 13th Battalion retreated they were shot to pieces by their own artillery. On the website www.ww1wargraves.co.uk: "The Battalion was deployed in two lines with “A” and “B” Companies leading and “C” and “D” Companies following 130 yards behind in support. “C” and “D” were already in the support trenches and therefore “A” and “B” could start as soon as “C” and “D” reached the front line – for no time could be lost. Although raked by machine guns from Ovillers still in the enemy’s hands the Riflemen upheld the best regimental traditions – penetrating three lines of enemy trenches, capturing 200 prisoners and inflicting heavy casualties on the enemy. Inexplicably after the attack had been launched, a runner of the 10th Royal Fusiliers caught up the rear companies after they had moved abut 200 yards forward with a message that the operation was cancelled but by then the Battalion was committed. The leading troops had penetrated the third line of the enemies trenches before the order to retire was given when the Battalion retired to its original position having lost 20 officers, including the Commanding Officer wounded, Second in command Major Sir Foster Bell killed in action, the Adjutant and all four Company Commanders two Captains Walter Bladen and Geoffrey Smith being killed in action and 2nd Lieutenants Ernest Boothby and Douglas Bruce being killed in action. About 380 other ranks were casualties, 76 being killed in action."